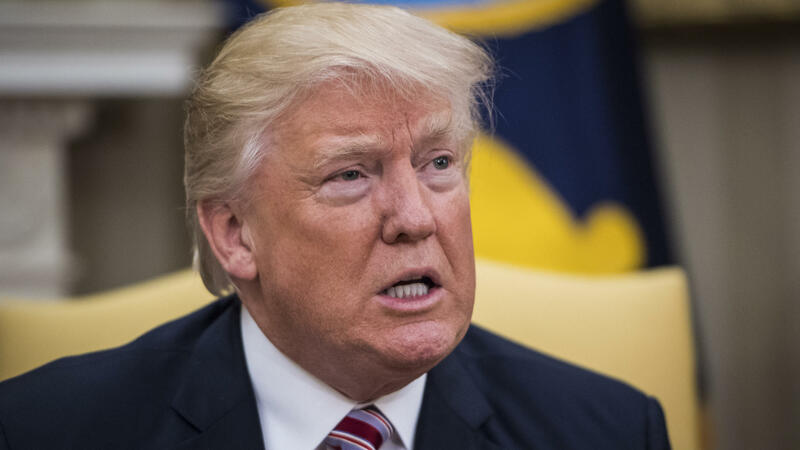 President Trump, seen in the Oval Office on Wednesday, spoke out publicly for the first time Thursday about his firing of former FBI Director James Comey. Undermining the prior rationale laid out by the White House, President Trump said he decided to fire James Comey as FBI director without regard to the Justice Department's recommendation. "It was set up a while ago," Trump admitted to NBC's Lester Holt in his widest-ranging remarks about his firing of Comey. "And frankly, I could have waited, but what difference does it make?" He added, "Regardless of recommendation, I was going to fire Comey." So why did he make the decision? "He's a showboat. He's a grandstander," the president said of Comey. "The FBI has been in turmoil. You know that; I know that; everybody knows that. You take a look at the FBI a year ago — it was in virtual turmoil, less than a year ago. It hasn't recovered from that." Trump blamed Democrats for the Russia storyline. "When I decided to just do it [fire Comey]," Trump said, "I said to myself, I said, you know, this Russia thing with Trump and Russia is a made-up story, it's an excuse by the Democrats for having lost an election that they should have won." But he said he never asked Comey to shut down the investigation and wants it seen through to the end, but by someone "competent" at the FBI. "I am a big fan of the FBI," Trump said. "I love the FBI." Trump abruptly relieved Comey of his duties Tuesday. The reasoning the White House officially gave then — in writing — was Comey's handling of the Clinton email investigation, based on a review by the deputy attorney general, Rod Rosenstein. Vice President Pence also asserted multiple times on Wednesday that Trump's dismissal of Comey was predicated on the recommendations of Rosenstein. But both Democrats and Republicans are raising questions about the timing of Comey's firing. It comes just as the FBI appeared to be ramping up its investigation of Trump associates' ties to Russia. White House spokeswoman Sarah Huckabee Sanders said Wednesday that the president has been thinking about firing Comey since November. At Thursday's White House press briefing, Huckabee Sanders said she had a chance to speak with the president before she went out to the podium and said the "last straw that pushed" him was Comey's testimony before Congress on May 3. In that testimony, Comey said he was "mildly nauseous" to think that he may have swung the election after coming forward days before the election to say that he was reopening the Clinton email investigation. Raising more ethical questions, Trump also admitted that he called Comey to find out whether he was under FBI investigation. "If it's possible, will you let me know, am I under investigation?" Trump told Holt he asked Comey. That's a remarkable admission, given the delineation most presidents and FBI directors are careful to try to draw. They don't want even the appearance of collusion or interference in what are supposed to be independent investigations, especially ones that might be related to themselves. Comey was so careful, for example, to avoid the appearance of impropriety that during the Obama years, the 6-feet-8-inch Comey was sure to never play basketball with the then-president. Trump also said Comey told him two other times that he was not under investigation, once on the phone and once during a dinner that had been "arranged." Trump initially claimed in the interview that Comey asked for the dinner to ask to stay on as FBI director. But Comey did not need to do that. He was appointed to a 10-year term in 2013. Trump also told Holt that just because he fired Comey doesn't mean he doesn't want to get to the bottom of Russian meddling in the election. "I want to find out if there was a problem in the election having to do with Russia," Trump said, adding, "If Russia did anything, I want to know that." He insisted, though, that his campaign and Russia did not collude. "I have nothing to do-- this was set up by the Democrats," Trump said. "There's no collusion between me and my campaign and the Russians. The other thing is the Russians did not affect the vote. And everybody seems to think that." The U.S. intelligence community has concluded that Russia meddled in the election — by hacking and leaking Democratic campaign emails, for example. The intelligence community has also concluded that Russia was trying with its efforts to get Trump elected. "I want that thing to be absolutely done properly," Trump said of the investigation, though — despite the intelligence community's conclusions — three times he qualified Russia's involvement with "if". "If Russia hacked," Trump said, "if Russia did anything having to do with our election I want to know about it." Holt pointed out that the evidence already exists that Russia did meddle. "I'll tell you this," Trump said, repeating, "if Russia or anybody else is trying to interfere with our elections I think it's a horrible thing and I want to get to the bottom of it and I want to make sure it will never ever happen." He said he thought the investigation "should be over with, in my opinion, should have been over with a long time ago. 'Cause all it is, is an excuse but I said to myself, I might even lengthen out the investigation, but I have to do the right thing for the American people. He's [Comey] the wrong man for that position." The White House claimed Wednesday that morale was low at the FBI and was also a reason behind Comey's dismissal. 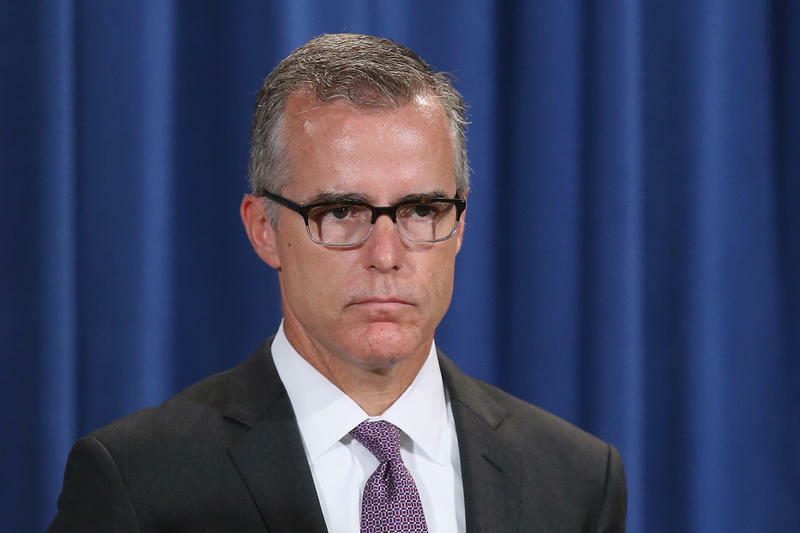 That, however, was disputed by acting FBI Director Andrew McCabe, who said at a congressional hearing Thursday that Comey had the full confidence of the bureau. On Wednesday, in brief remarks in the Oval Office, Trump told reporters that he fired Comey "because he wasn't doing a good job, simply. He was not doing a good job." Since the election, Comey has publicly confirmed that there was an ongoing FBI investigation into Trump associates and collusion with Russia, and he disputed under oath the president's baseless claim that President Barack Obama ordered his team to be wiretapped. Comey also requested significantly more resources for the Russia investigation from Rosenstein and briefed key senators on that request Monday, the same day another congressional hearing on the Russia investigation took place at which former national security adviser Michael Flynn's and the White House's conduct was the central focus. Comey was fired the next day, which was dominated by bad headlines for Trump on why Flynn was kept on for 18 days after Sally Yates, the former acting attorney general, told White House counsel Don McGahn that Flynn had been compromised. The absence of former FBI Director James Comey loomed large over the Senate Intelligence Committee's hearing with top U.S. intelligence leaders, but his temporary replacement, acting FBI Director Andrew McCabe, assured lawmakers he would not bend to pressure from the White House. 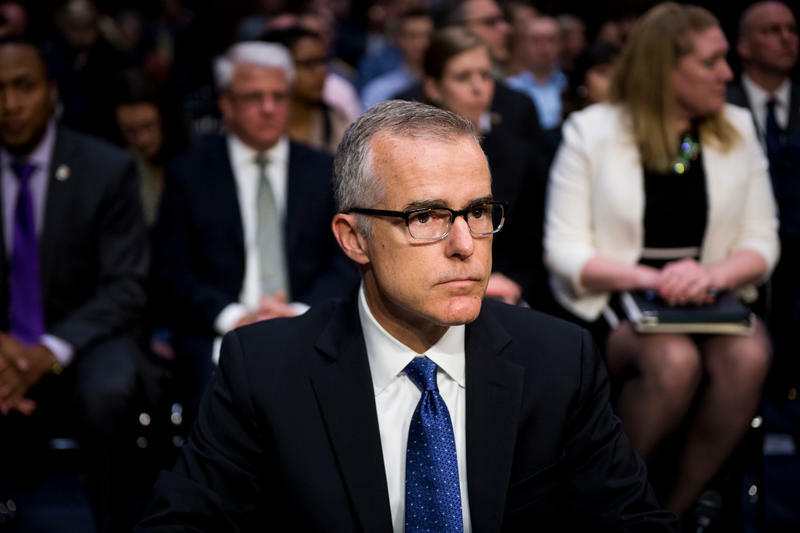 "You cannot stop the men and women of the FBI from doing the right thing, protecting the American people and upholding the Constitution," McCabe said. Want to prepare for the Senate Intelligence Committee's hearing on Thursday? Buckle up. Democrats led by Vice Chairman Sen. Mark Warner of Virginia are angry enough to blow the dome off the Capitol after the man they expected to be a star witness — James Comey — was removed from office as FBI director by President Trump on Tuesday. 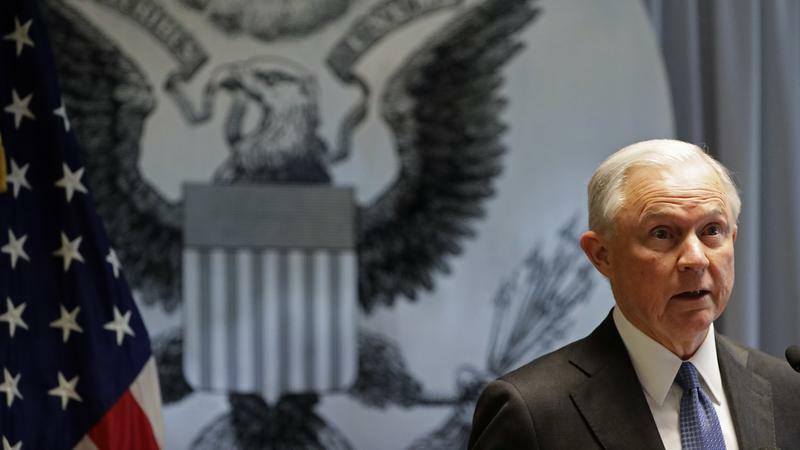 Attorney General Jeff Sessions and Deputy Attorney General Rod Rosenstein were interviewing four candidates Wednesday to serve as interim FBI director, following the firing of James Comey.